­­­­­­­­­­­­­­­­­­Not all bodies are created equal. Therefore, concealed carry cannot be handled with a “one size fits all” mentality. Comparing women to men, we see the obvious differences from bone structure to curves. Even among women, there are many differences. With a vast array of curves, sizes, and shapes among one gender, it truly makes the art of concealment a much more daunting task. This daunting task becomes more challenging when you add in the fact a woman’s wardrobe is far more diverse. Many women resort to off body carrying, which I strongly advise against. I want to share with you ways to make concealed carry for women not only possible, but also simpler. Stick with me in this article for some tips and tricks, do’s and don’ts and a few opinions from some other women in the industry to learn, “the art of concealment”. Let’s keep it real. Concealing a firearm on your body is not going to be “comfy cozy”. It isn’t going to bend and mesh with your body as if it weren’t there. It shouldn’t be painful or overly awkward, but the definition of “comfortable” needs to be clear and quite possibly redefined. Practicing daily-concealed carry will help make it become more natural. The rest you’re about to read is based on the fact you’ve taken time to find the right firearm to carry. A large misconception is women need something small. Just because a firearm is smaller, doesn’t make it easier to handle. This, however, is another article for another time. “comfortable” needs to be clear and quite possibly redefined. The most important thing you can do is practice drawing your gun correctly from the position you carry. Carrying is only effective if you can quickly and easily run your gun. 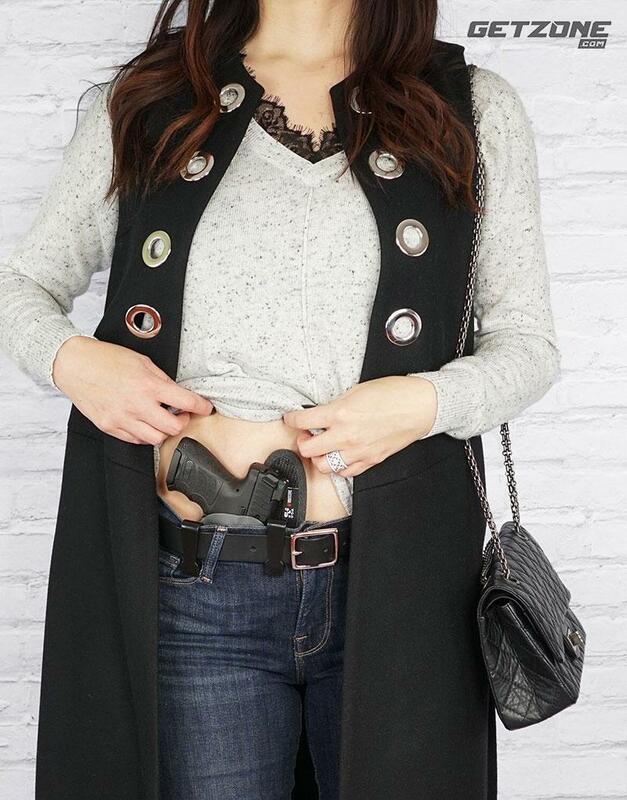 Consider where you will carry based on your outfit. Try to place yourself in a mental scenario where you’d need to draw your gun. Although well concealed, can you get to it? Can you draw effectively and quickly? For me, modesty goes out the window. Some women hesitate on placement when they think of what will be exposed. If I am in a situation where I need to draw my gun, it is life or death. At that point, the amount of skin exposed is not relevant. Karen and her AIWB holster with sidecar from SilverbackGunworks. Always be aware of gun placement and never fidget or mess with it. We have tendencies to fidget with our clothes. Pulling our pants up, shirts down, bra straps adjusted etc. Try not to fidget with your gun attracting attention to the fact you are carrying. People tend to be hypersensitive about carrying a concealed firearm, however, people around us have no idea. No one is looking at us trying to guess where our gun is. A little trick here is to always use eye contact and a friendly smile. This keeps the eyes of others up and the focus is on your face. Always be aware of gun placement and never fidget or mess with it. What is out there for us to use? We either have zero clues as to what’s available or we are inundated with too much information and no idea where to start. I weighed in with some very knowledgeable ladies in the industry so that you not only get my advice but theirs also. We as women are unique so I believe you should have several avenues of opinions to consider. My usual go to is a belt and holster, or the Ulticlip. Jeans seem easy, but can be very difficult. The main issue with women’s jeans is shallow pockets. 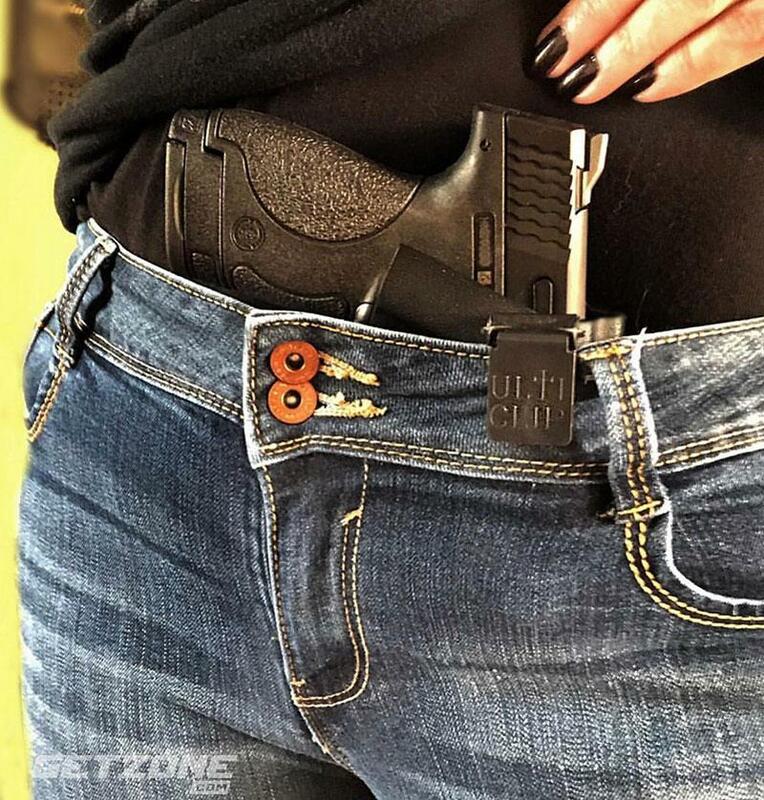 Many women cut holes in the bottom of their pockets to facilitate an extra mag. I was the same way until I discovered a holster with a sidecar. This holster has a special place for an additional mag. It may look larger, but it’s easy to conceal. It has a small wing on the side, which literally pushes the holster more into the body. When carrying with a belt, wear the buckle off to your side instead of front and center. This helps create less bulk allowing everything to appear more “flat” and easier to conceal. On “no belt” days I reach for my Ulticlip holster. The Ulticlip firmly attaches onto your waistband. Note: This is the only time you should ever go without a belt. The Ulticlip has been designed and tested to stay attached. Regular holsters should never be worn without a belt. The key is to make sure the pants are sturdy. I practice my draw with every pair of pants I wear to ensure the holster stays in place and also to make sure getting the gun out isn’t hung up by a wardrobe malfunction. The convenience of the Ulticlip is beyond compare. Get dressed, clip it on and go. No need for micros, you can carry a bigger gun and remain fashionable and feminine. Here is Karen with her Tiffany blue holster from Westac Holsters complete with Ulticlip. There are times when my outfits will not accommodate either above. Belly Bands are a lifesaver in these instances. They’re a versatile option and one of my favorites. 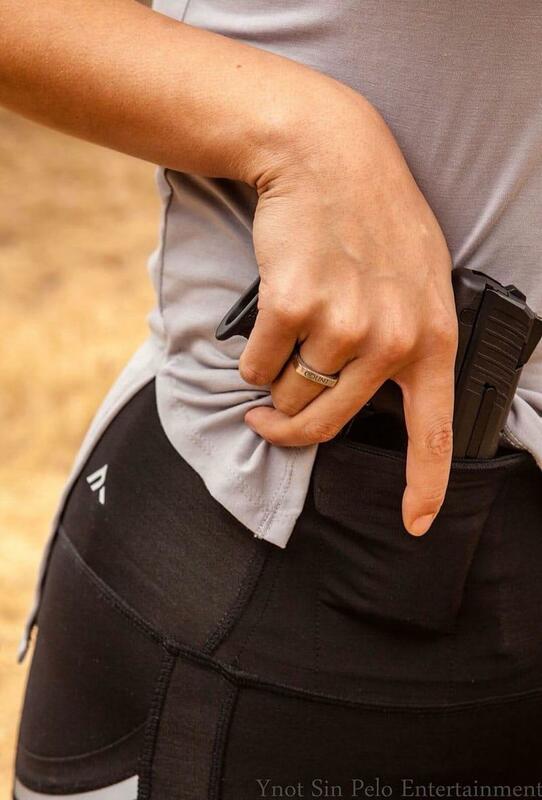 Belly Bands should have a good trigger guard and stay in place. On that note, any holster should have a good trigger guard keeping the trigger protected — A N.D. regardless of reason is bad news. Sizing is important — be certain you have the right size for you. The last thing you want is to have the Velcro let go like a tight blood pressure cuff and your carry system ends up on the deck or worse. They can be worn around the hips, waist, and upper stomach and even up underneath your breasts. This gives you a choice of positioning for an array of different outfits. The Crossbreed Modular system is safe and extremely versatile. 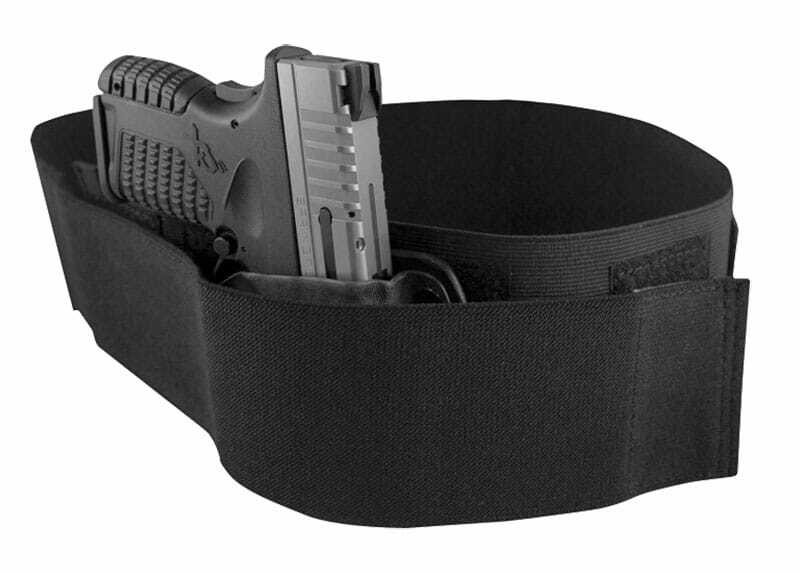 The belt is Velcro and it comes with a holster that attaches with the Velcro band then covering the holster. It is secure and gives you the freedom of carrying in various places anywhere on the band. You can check out the modular system at www.crossbreedholsters.com. Crossbreeds Modular Belly Band System is one of the most innovative designs for concealed carry. Photo courtesy of Crossbreed. Now, Let’s listen to what some leading experts have to say. “I use a Can Can Concealment Holster, the hip hugger micro. 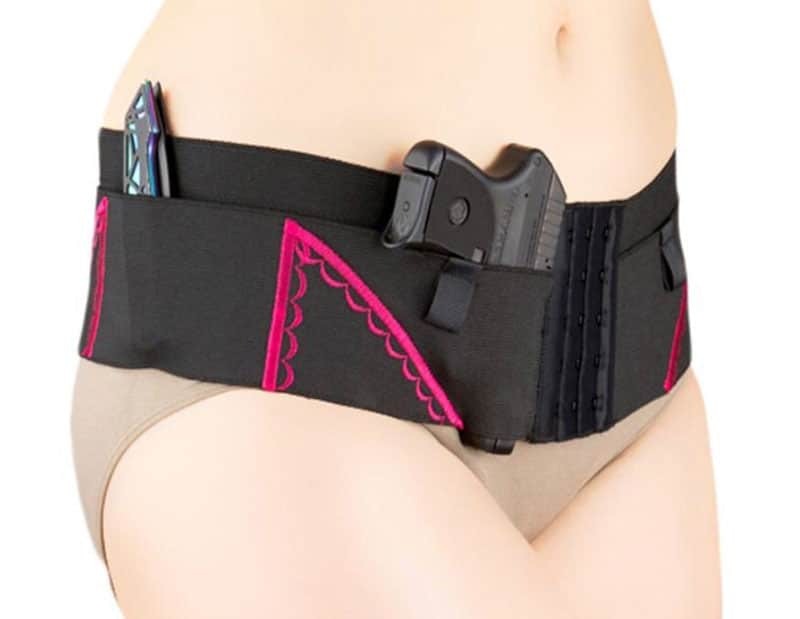 I am not a fan of holsters that look girly or like lingerie but this one works for me. It has several rows of hooks allowing you to loosen or tighten depending on exactly how high or low you want it to ride on your hips/waist. I can adjust the holster to the right spot whether I have low or high-rise jeans on. This holster works great with running shorts and skirts as well. It is set up for appendix carry, side or back allowing me to adjust where I conceal if needed. 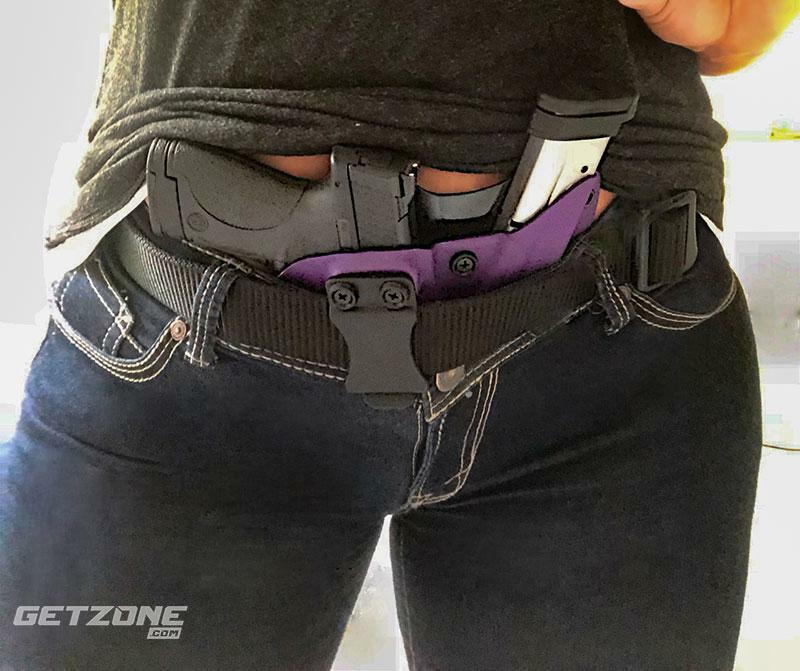 I was not a fan of appendix carry until this holster, now I prefer it.” – Jessica Kallam, Remington Outdoor Company, Inc.
Ventcore Appendix Holster from StealthGearUSA. One of the most amazing items to enter the world of concealed carry is the Alexo athletic/yoga pants. Nine pockets to hold everything you need. Being a huge advocate for carrying everything on your person, these pants literally call to me. They are safe, effective, functional, comfortable and fashionable. These are becoming a “must have” for every woman. 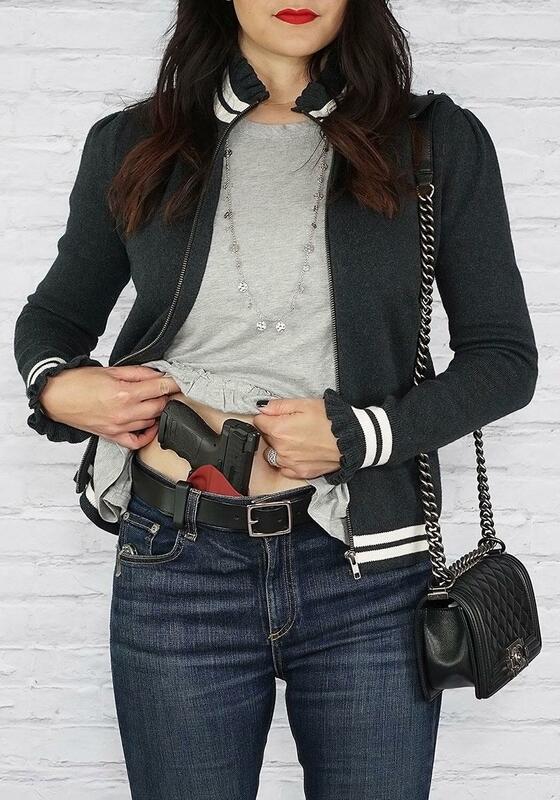 At the gym or at the range Alexo Athletica takes the guesswork out of concealed carry. My hope is that this article has shed light on a few key possibilities you can utilize. There’s so much more to cover than could ever be established in one article. I encourage you to research this topic to gain knowledge and ideas. Also, to put the time into practicing your draw in every way you decide to carry. It is always our first responsibility to carry safely for others and ourselves.